How do you know if you have multiple sclerosis (symptoms and signs)? Can multiple sclerosis symptoms and signs worsen during pregnancy? Can pregnancy cause multiple sclerosis? What problems can multiple sclerosis cause during pregnancy? Can multiple sclerosis affect fertility? What multiple sclerosis drugs are safe to take while trying to conceive or during pregnancy? What if I am diagnosed with multiple sclerosis while I’m pregnant? Multiple sclerosis (MS) is an autoimmune condition that results in a disruption of information signals between the body and the brain that can cause neurological symptoms. MS is more prevalent in women of childbearing age than in any other group. Pregnancy reduces the number of MS relapses, but flares increase during the first three to six months following childbirth. Postpartum relapses do not seem to increase the progression of MS or the rate of long-term disability. Multiple sclerosis can make delivery more difficult. It may be difficult for women with MS to tell when labor begins, and there is an increased need for forceps or vacuum to assist with delivery, or Cesarean birth (C-section). MS does not seem to affect fertility and a woman’s ability to become pregnant. Women with MS who are pregnant should not take certain medications including most disease-modifying therapies (DMTs), baclofen (Gablofen, Lioresal), fluoxetine (Prozac, Sarafem), or solifenacin succinate (VESIcare). Disease-modifying therapies also are not recommended for use while breastfeeding. 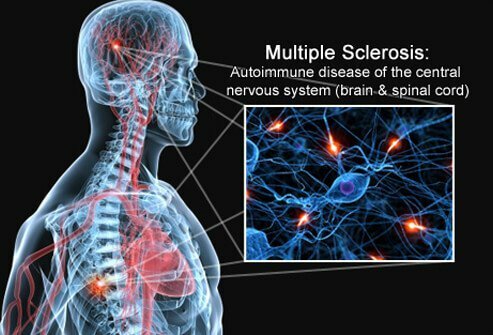 Multiple sclerosis, or MS, is an autoimmune condition disease of the central nervous system in which the body attacks the myelin sheath, the protective covering around the nerves. This results in a disruption of information signals between the body and the brain that can cause neurological symptoms that very widely in severity. According to The National Multiple Sclerosis Society, multiple sclerosis is more prevalent in women of childbearing age than in any other group. The usual age of onset of multiple sclerosis is between 20 and 50, and at least two to three times more women than men are diagnosed with the disease. Multiple sclerosis may make carrying a pregnancy more challenging in some women. Fatigue is the most common symptom of MS, and pregnant MS women may experience greater fatigue. Women with MS who have pre-existing problems walking or balance problems may find these symptoms worsen later in pregnancy as they gain baby weight and their center of gravity shifts. Bladder and bowel problems are common in all pregnancies, and these symptoms may be worse in women with MS who already have urinary or bowel dysfunction. Women with MS who are in wheelchairs may have an increased risk of urinary tract infections. Studies have actually shown that pregnancy reduces the number of MS relapses, especially in the second and third trimesters. It is thought that the increase in circulating proteins and other natural immunosuppressants combined with elevated levels of natural corticosteroids in pregnant women may result in women with MS experiencing fewer relapses during pregnancy. However, relapses (flares) in in the first three to six months following childbirth are 20%-40% more likely to occur. The good news is that the postpartum relapses do not seem to increase the progression of MS or the rate of long-term disability. Pregnancy does not cause multiple sclerosis, but if you have undiagnosed MS you may experience symptoms for the first time during pregnancy. Having multiple sclerosis can make delivery more difficult. Pain sensations may be altered in people with MS, which means a woman may not feel pain with contractions. This can make it difficult to tell when labor begins. The pelvic muscles and nerves used for pushing during delivery may also be weakened. Some women with MS may require the help of forceps or vacuum to assist with delivery, or may need a Cesarean birth (C-section). MS does not seem to affect fertility and a woman’s ability to become pregnant. There is also no evidence of an increased number of spontaneous abortions, stillbirths, or birth defects in women with MS. One small study showed a significant increase in multiple sclerosis symptoms after fertility treatments (assisted reproduction technology, or ART). Women with MS should discuss possible risks of these treatments with their doctors. If you have MS and are trying to get pregnant, talk to your doctor about what medications you may be able to take. Disease-Modifying Therapy (DMTs) is not approved for use during pregnancy as it may harm a developing baby. The one exception is glatiramer acetate (Copaxone or generic Glatopa). Interferon betas including interferon beta-1a (Avonex, Plegridy, Rebif) and interferon beta-1b (Betaseron) may also be safe to take during pregnancy. Many drugs used to for treatment of MS symptoms may also have adverse effects on a fetus and should not be used during pregnancy, including baclofen (Gablofen, Lioresal) for spasticity, fluoxetine (Prozac, Sarafem) for depression, and solifenacin succinate (VESIcare) for bladder management. Corticosteroids for acute MS relapses can often be taken during pregnancy. All forms of anesthesia are considered safe for women with MS during labor and delivery. If you are diagnosed with multiple sclerosis while pregnant, talk to your doctor about the best ways to manage your pregnancy and your disease. You may not be able to take certain medications for your MS symptoms; however, there is no evidence that having MS will cause harm to your baby. Multiple Sclerosis and Pregnancy. Johns Hopkins Medicine. 2018. Multiple sclerosis and pregnancy. March of Dimes. Updated: January 2014. Pregnancy and Reproductive Issues. National MS Society. 2018. What is MS? National MS Society. Multiple Sclerosis and Pregnancy. University of Rochester Medical Center. 2018. Please share your experience with multiple sclerosis during your pregnancy. It may help other pregnant women with MS.
Did MS symptoms worsen or get better during your pregnancy? Did flares and relapses worsen or get better? What problems of MS were caused by your pregnancy? What MS drugs were you able to take during your pregnancy? Please share your experience. It may help other pregnant women with MS.